Ubiquitous in Vietnam, once exotic to us, we won’t hesitate to say that motorbikes are the way to go when exploring Vietnam. We got our first taste of the open road with EasyRiders. Once that happened, we never looked back on our ‘scooter short-term rent’ days. We are working on putting together a comprehensive rundown of what we learned on the subject of riding, driving, and owning motorcycles in Southeast Asia. 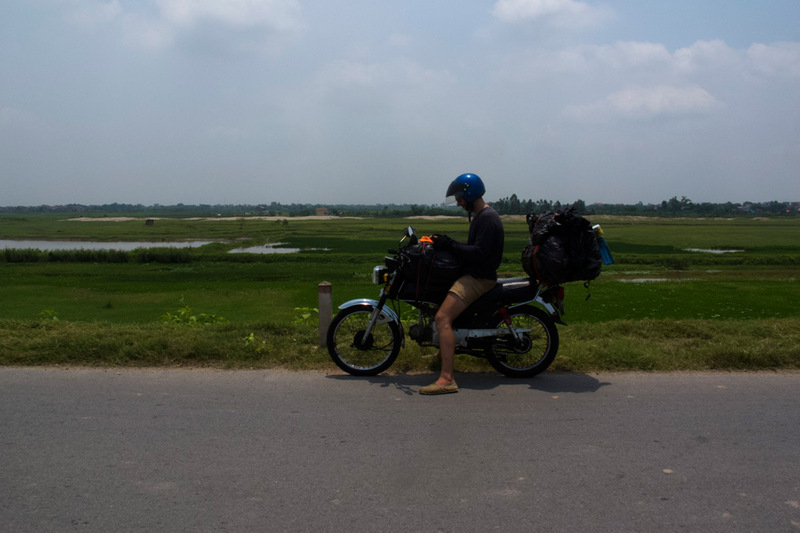 But in the meantime, here’s a rundown of how we spent about two weeks on the back of the motorcycle, traversing half the country from Hanoi to Hoi An. 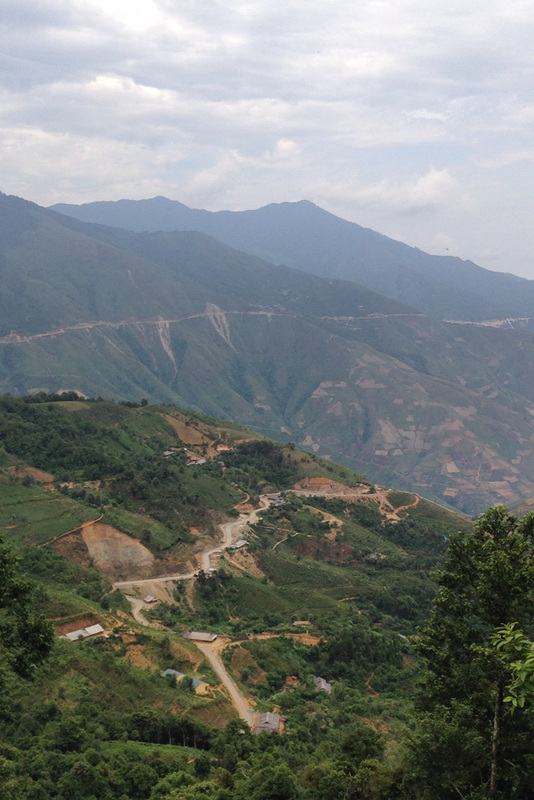 Mountain roads in Mai Chau, which we navigated with iphone google maps. En Route, Vietnam. Our itinerary was dictated by our visa stamp — we had to get to Lao Bao border crossing between Vietnam and Laos in a certain timeframe. There were a few instances when we wished we had more time to spend in some of the locations. If there is one recommendation we would make from this experience, it’s that the more time you spend off the bike — whether its just stretching, playing a game of pick up football with local kids, or checking out some neat attraction — the better. We tried, the best we could, to limit our riding days to 6 hours per day. When that didn’t happen, it wasn’t pretty. With that said, here’s the rundown of where we went, where we stopped, what we saw, and what we thought of it all. If you want to know about accommodations that we found along the way, check out our ‘where to stay’ page. 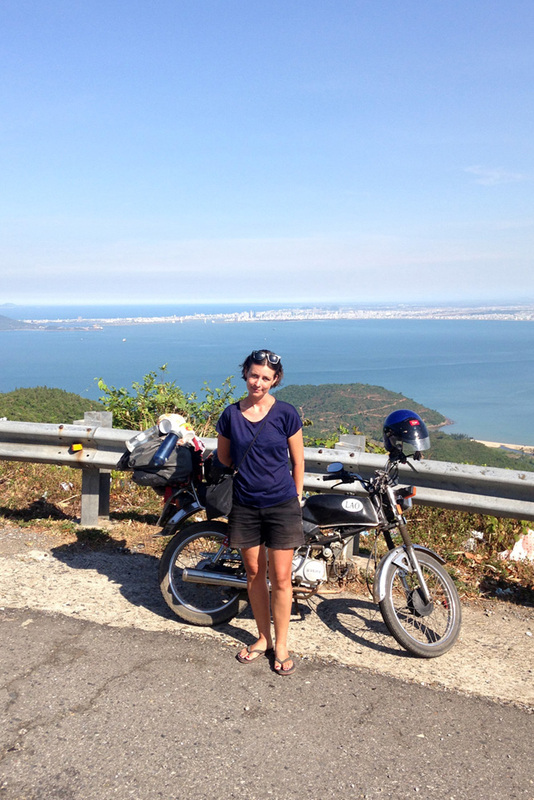 An easy and picturesque ride from Hanoi to Phu Yen by local highways, which took us about 6 hours to complete. We were slow driving, making frequent stops to stretch and get refreshments. 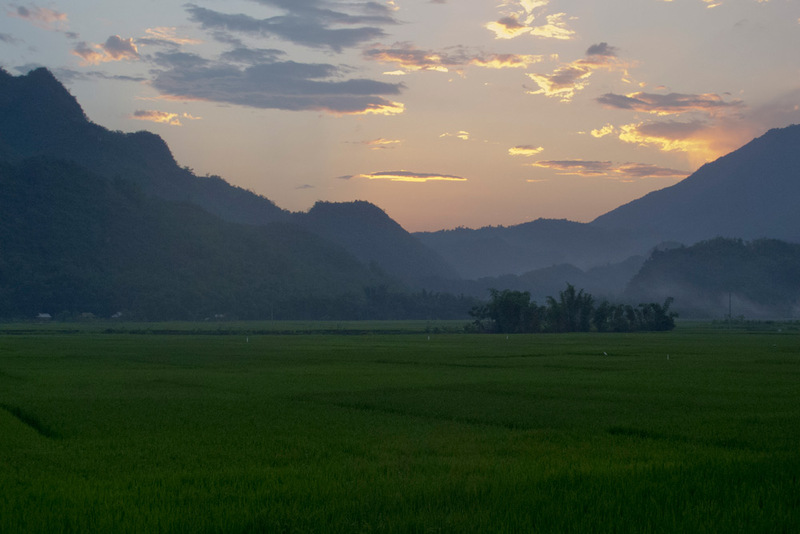 Sunset over rice paddies in tt. Phu Yen, Vietnam. We rolled into town mid afternoon, hung out at the local bia hoi pub, and set off in the evening to find some dinner. We tried to get recommendations for food from a few locals, but had no luck in communicating. Then we passed a local karaoke joint with a bbq pit outside. It looked intriguing…and, the aroma was quite enticing. The staff spoke zero English, but we took a chance by pointing at the grill. I am quite serious when I say that this was the best “accidental” order we’ve ever placed. 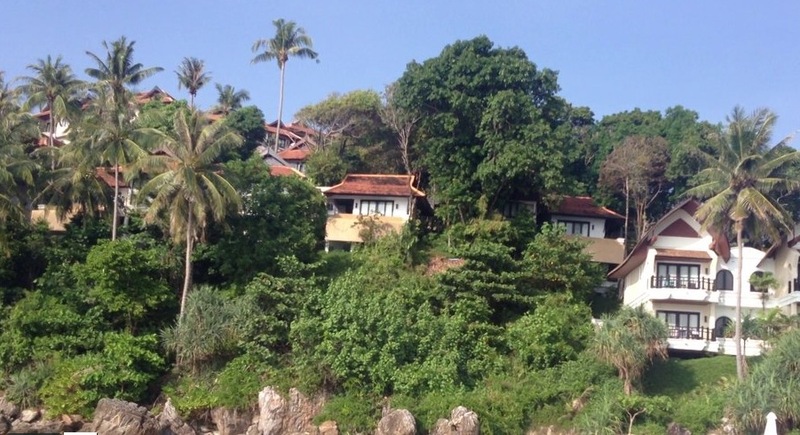 We had an extra day budgeted into our itinerary, and made the decision right then at the dinner table, to stay in the town so that we could eat here again, and explore the Ta Sua Nature reserve on our day off. The view from our balcony at Hong long Hotel in tt. Phu Yen, Vietnam. The town itself was very pleasant, and we even got a chance to play celebrities for a day. While we weren’t able to secure reliable recommendations for a place to eat, we did exchange some biographical information with a few locals who spoke Russian – a fairly frequent trait among older Vietnamese, particularly in Northern Vietnam. The next day, half the town’s vendors knew who we were, waving hellos and saying Nga – Russian in Vietnamese. We happily exchanged smiles and attempted to communicate how much we love Vietnam with our very heavily accented few words of Vietnamese. We had a lot of fun taking portraits of residents of tt. Phu Yen, Vietnam. Most of them got as much of a thrill at looking at the images on our camera, as we had in taking pictures of them. Again very easy, ‘pleasant on the eyes’ road via local highway. It took us about 6 hours to ride from tt. 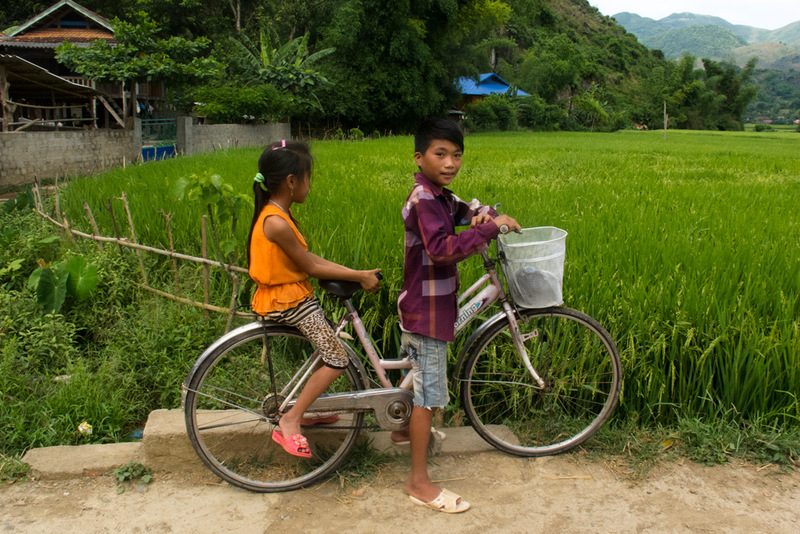 Phu Yen to Mai Chau, with a few breaks and a stop for lunch. We left tt. Phu Yen just as school kids were off to start their learning for the day. They were so eager to practice their hellos with us! En Route, Vietnam. 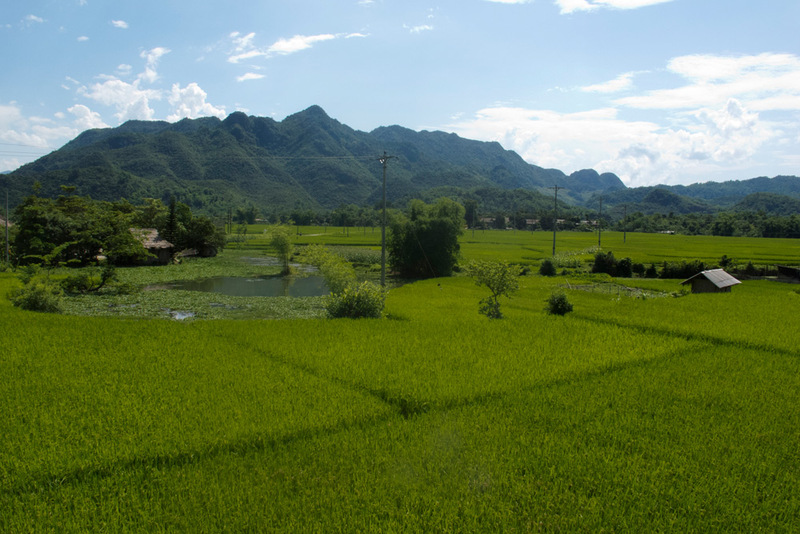 This was our second time in Mai Chau, and we totally spoiled ourselves with a stay at Valley View lodge. The views from those balconies are ridiculous. Totally worth the money, especially seeing how the rest of the hotel is great. Rice paddies just outside of Valley View Hotel. 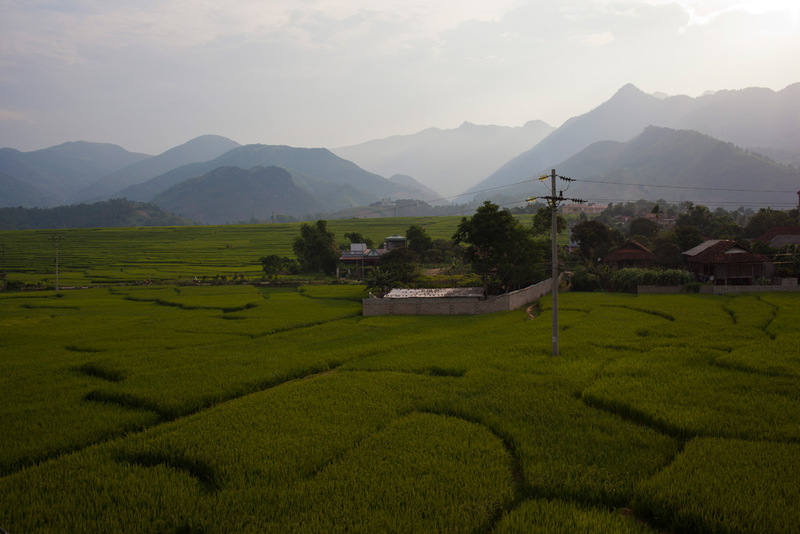 Mai Chau, Vietnam. 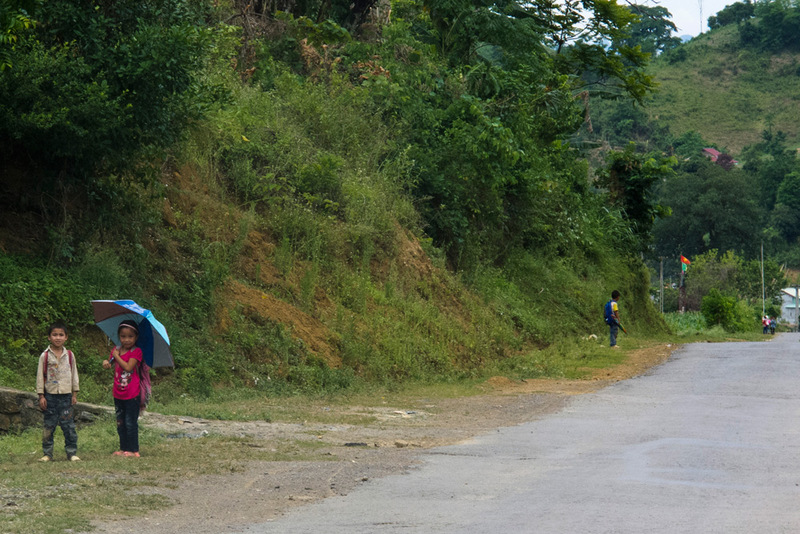 In the evening, once the heat receded a bit, we ventured for an easy walk in the rice paddies and minority villages around the hotel. Pretty great scenery, eh? 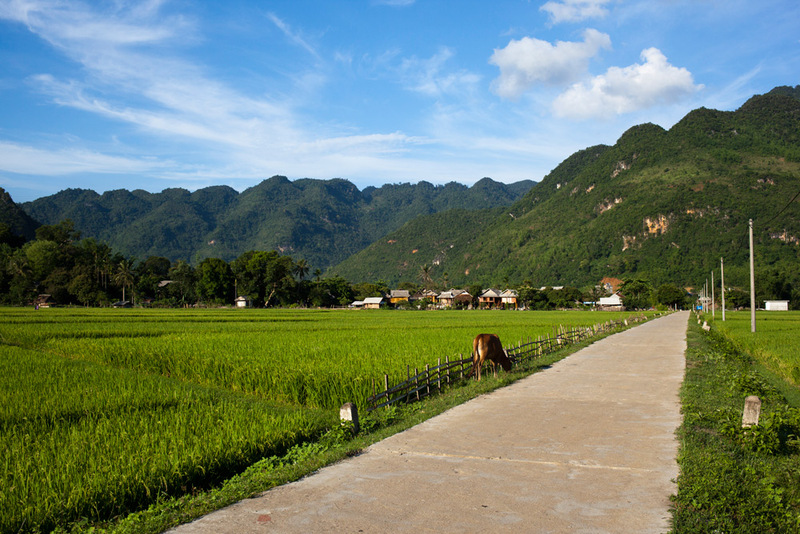 We wish we had more days to spend in Mai Chau. 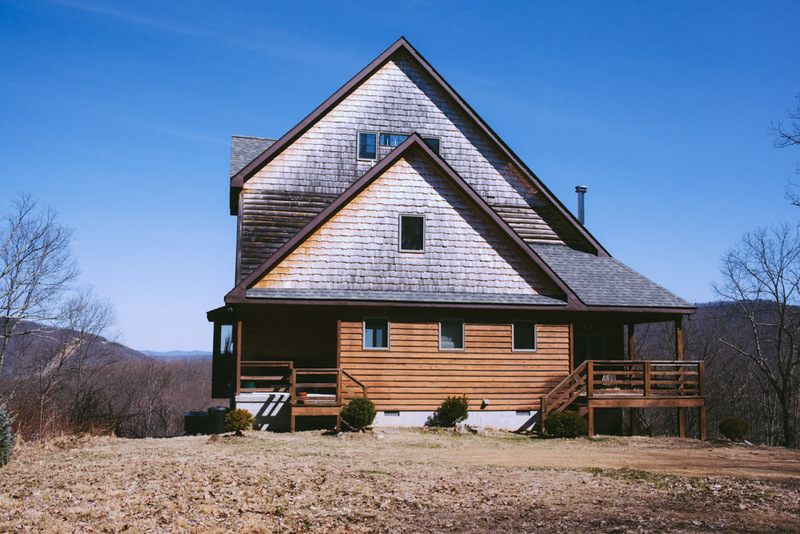 We would have done a homestay and a lot more exploring — we hear there is great hiking and adventures around these parts. Overlooking the village of Mai Chai, Vietnam. 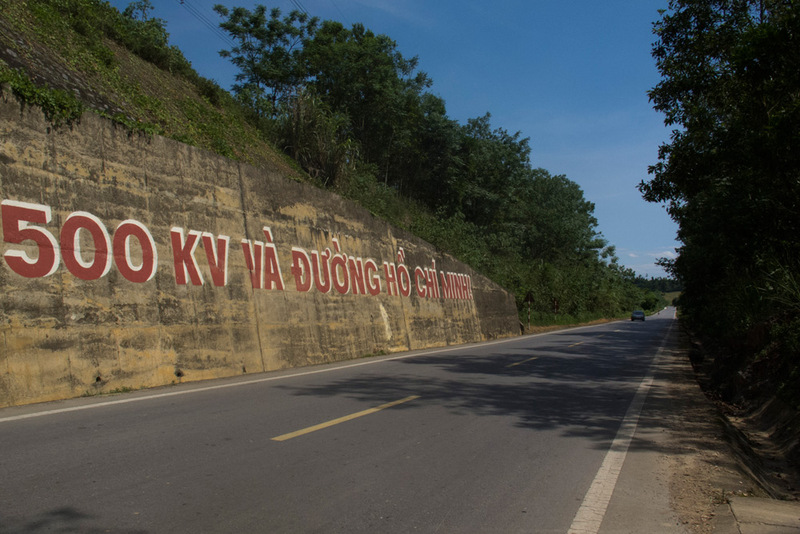 This stretch was tough: 280 km, some of it on the Ho Chi Minh Highway (it sounds more interesting than it is). This day took us about 7.5 hours to complete, with a stop for lunch, plus a few other longer breaks and shorter ones. 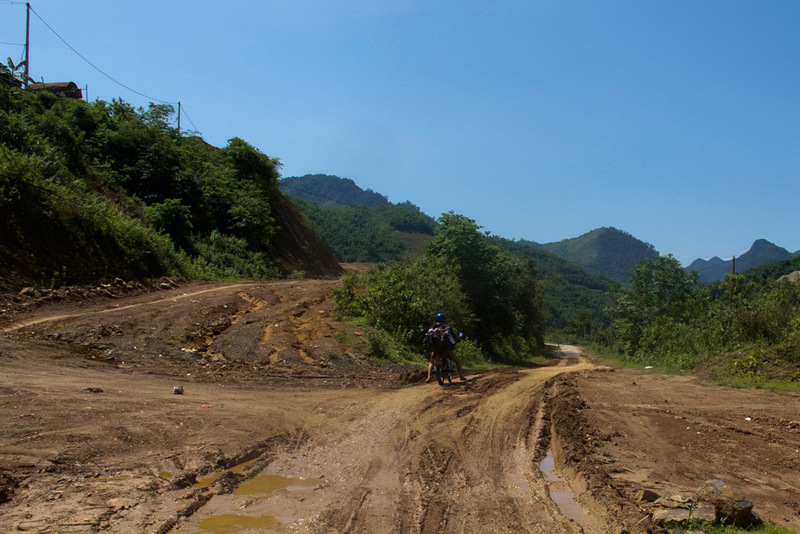 The roads – aside from a small muddy patch right outside Mai Chau, were mostly good, but the sun was merciless. No shade either. For the most part the roads are great. And then you run into something like this. I chose to walk, while Sergey struggled through the mud with our bike. Leaving Mai Chau, Vietnam. We did have an amazing diversion on this day. Looking for lunch, we pulled into a random roadside cafe along the way, after spotting a boisterous group enjoying bia hoi and banh mi. We excitedly pointed to the sandwiches, which made the owner very upset and apologetic. We gathered that banh mi were not on offer – no problem, we will just order some bia hoi. 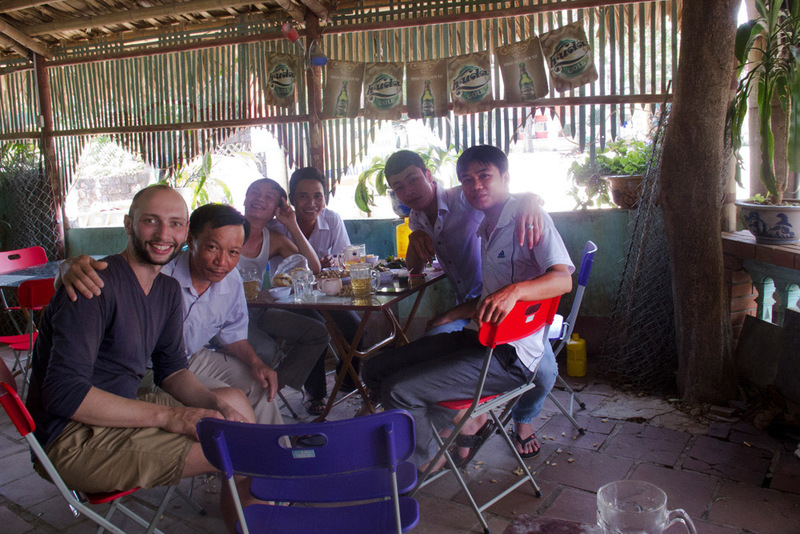 After much gesturing and talking among everyone but us, the lunch crew foisted their banh mi on us. Absolutely refused any of our attempts to say no. Ok, maybe we didn’t try that hard, but sometimes you just need to gratefully accept the offer of help. Many smart phone pictures were taken, cheers cheeresed, and two delicious banh mi consumed. We sadly bid goodbye to our new friends about 45 minutes later to get back to the open road. 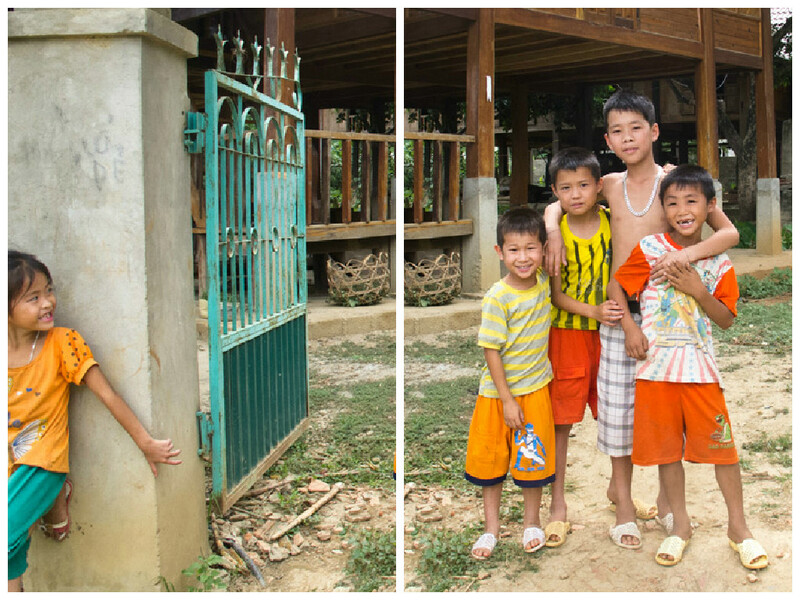 Making lunchtime friends on the road in Vietnam. We would not recommend Dien Chau as a stop. 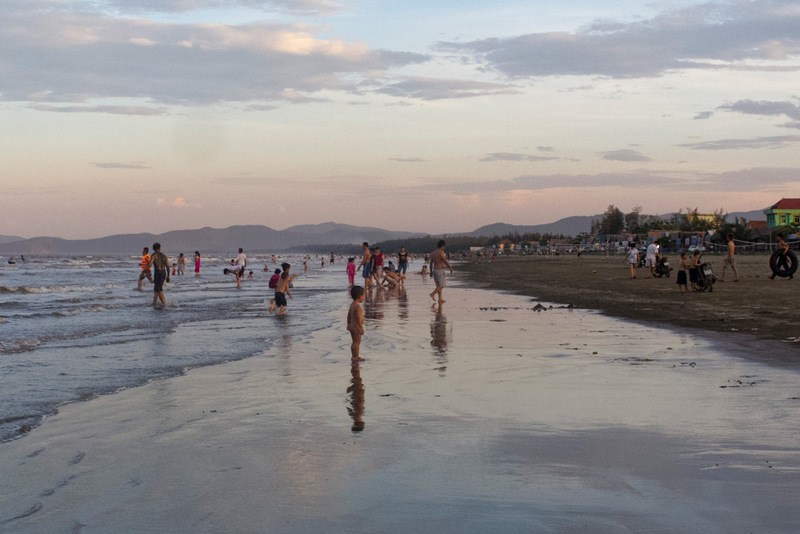 We had originally planned to overnight in Tan Ky, but changed our minds at the last minute to go for the beach. 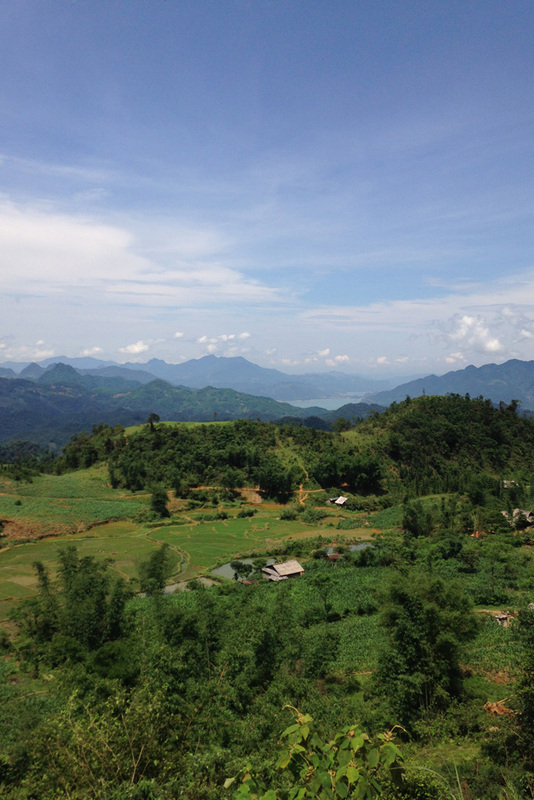 It appears that town of Lao Cau, just a little bit further down, might have been a better option, but we had done zero research on this and were also extremely ready to get off the bike. The beach at Dien Chau wasn’t great, but swimming felt nice. The hotels in Dien Chau are subpar, to put it nicely. 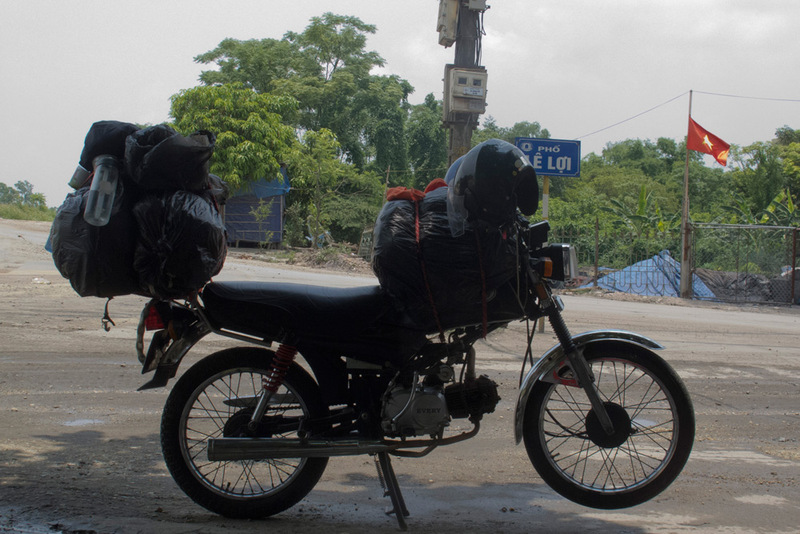 This was another long ride on the Ho Chi Minh highway, which is paved and in general good condition. But, the sun was brutal. Ho Chi Minh Highway — this was about as exciting as it got for us. Enroute, Vietnam. 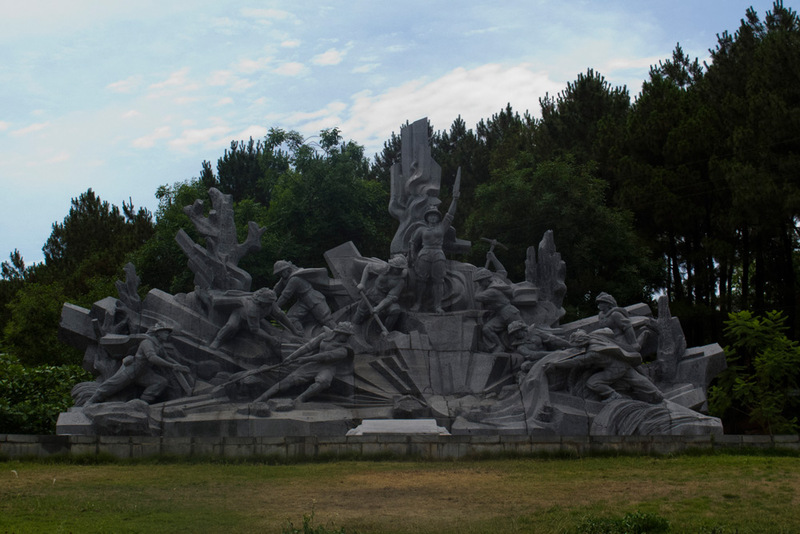 We took multiple stops to refuel and refresh, and check out memorials to the War. By this point we were in the middle of the country where a lot of the heavy fighting happened during the Vietnam – American war. 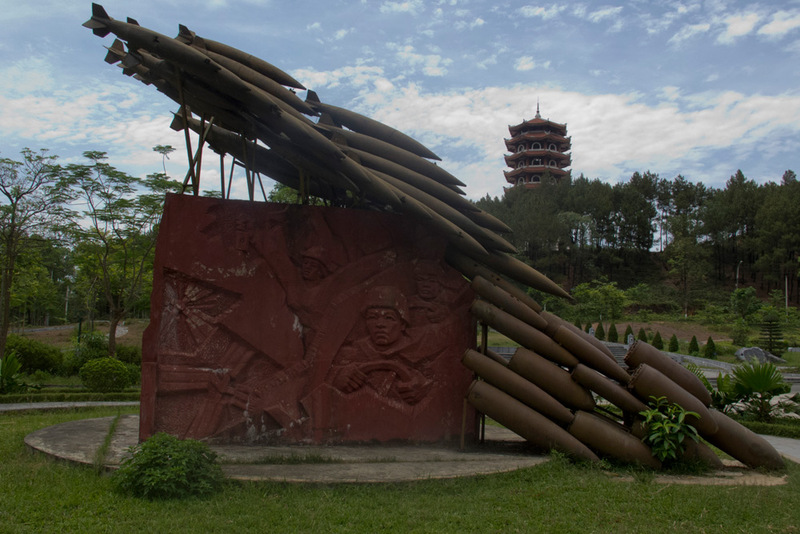 All of the former Indochina colonies were scarred by massive bombing campaigns — its not unusual to see real ammunition used as either makeshift household items, or incorporated into memorials to the War. Enroute, Vietnam. 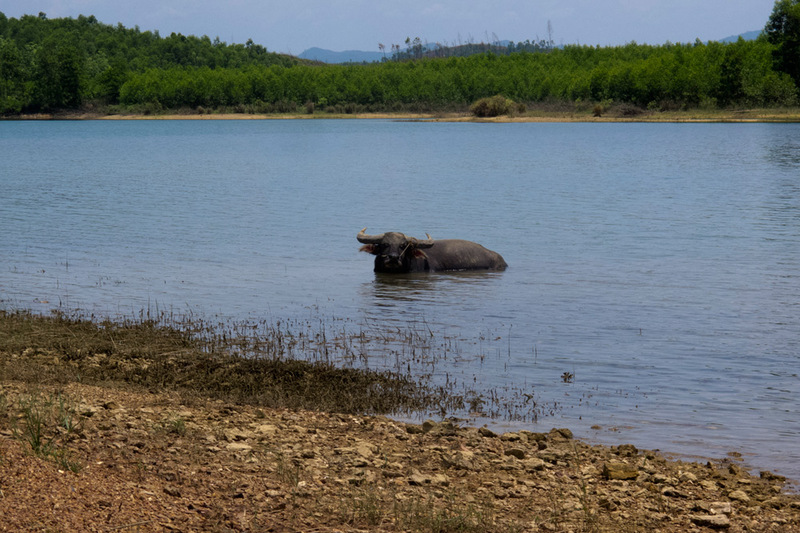 Just me and the water buffalo, enjoying some body of water. En route, Vietnam. 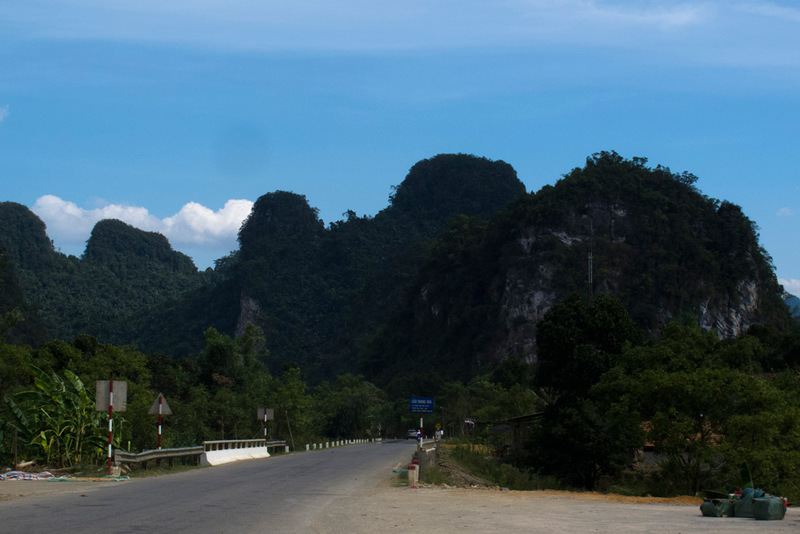 We spent two nights in Phong Nha area in order to visit Paradise Cave. We would have liked to spend at least one more day here and explore a few more caves on our own. By the way, it’s easy to organize yourself a nice crew of likeminded adventurers at Tiger Hostel. Of course, you can always go off on your own. 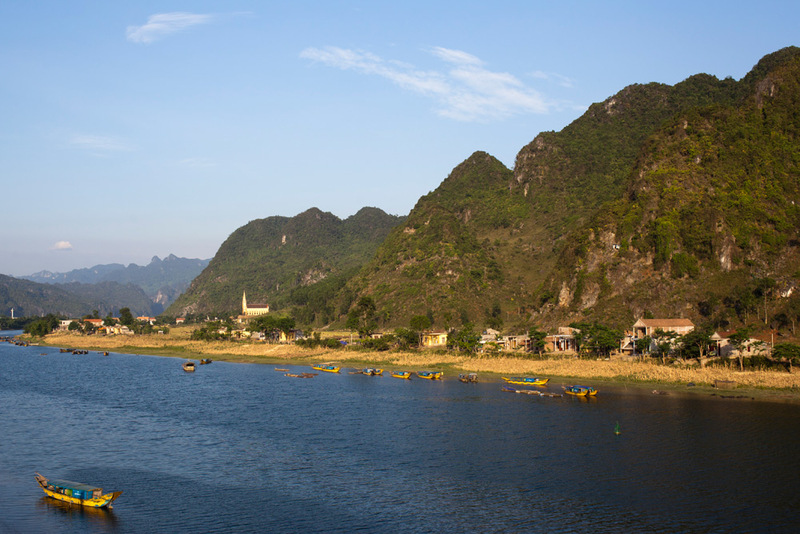 Son Trach village on Song Con river is the closest spot to Phong Nha Ke Bang National Park, Vietnam. We took the fast route out of Son Trach / Phong Na to the border crossing of Lao Bao, leaving at 10:30 in the am after sleeping in, and enjoying a nice swim in the pool of Phong Nha Farmstay. 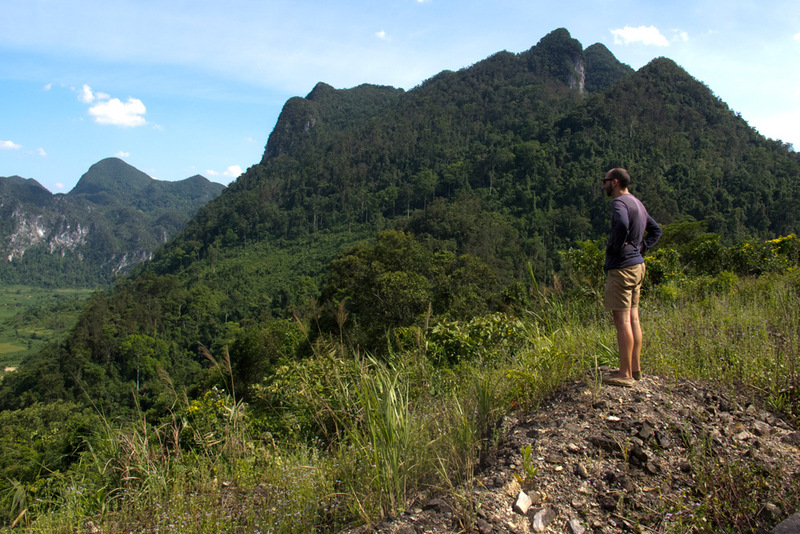 Goodbye Phong Nha Ke Bang National Park, Vietnam – and thanks for the adventures, it’s been real. The ride was pretty similar to the previous leg, with exception of lack of war memorials. It was brutally hot, we went swimming once, stopped for cafe dai once and bia hoi twice (yes, this is literary what my notes say). By 3:30 we were at Lao Bao border crossing. 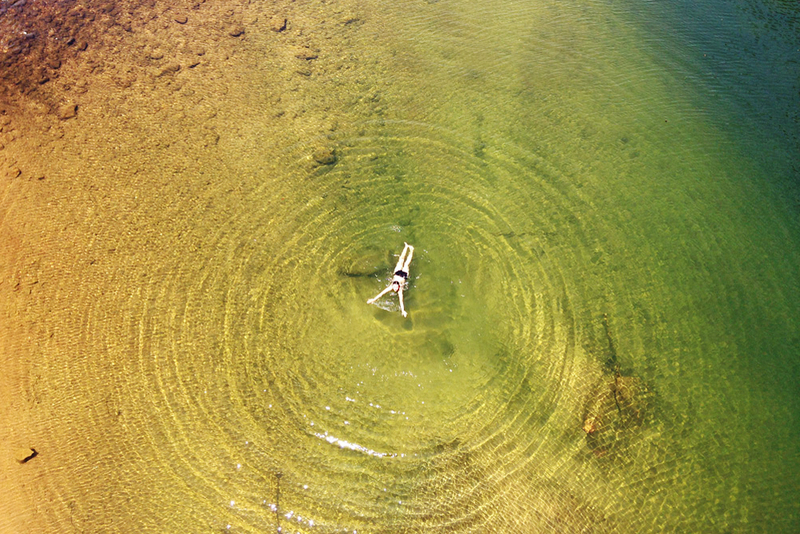 Swimming off the side of the road. Rather refreshing. You should try it. Enroute, Vietnam. We had to do a “visa run,” or rather an “entry stamp run.” Our Russian passports allow us visa-free entry into Vietnam, but only for 15 days, so we were under time crunch to get out, get it, and keep going. Border formalities took about an hour, as we took turns to walk across the border and back, while one of us watched the bike on the Vietnamese side. Our bike in rest mode. Enroute, Vietnam. Then we made a huge mistake. 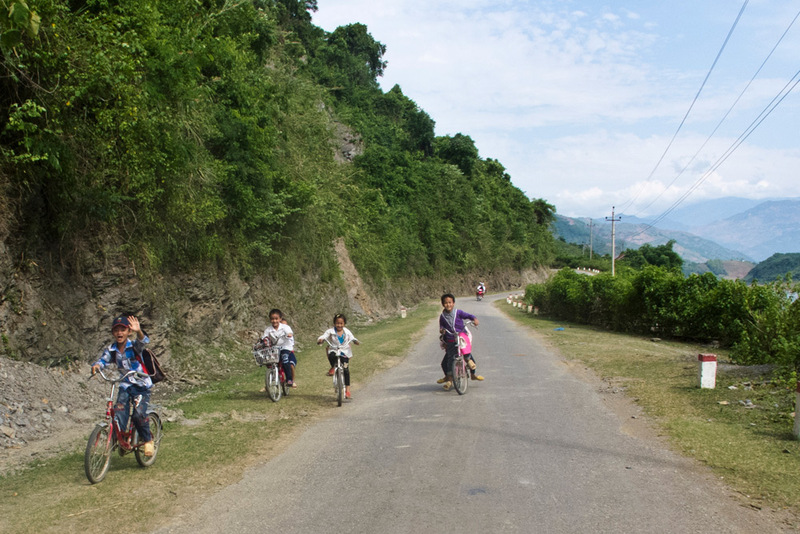 We got on our bike and kept going from Lao Bao to Hue. Should’ve stayed in Lao Bao or another small town around there. We got into Hue at 8:30 pm very, very soar from riding our bike for more than 10 hours. And the silliest part is that we already had our fresh entry permits in hand! 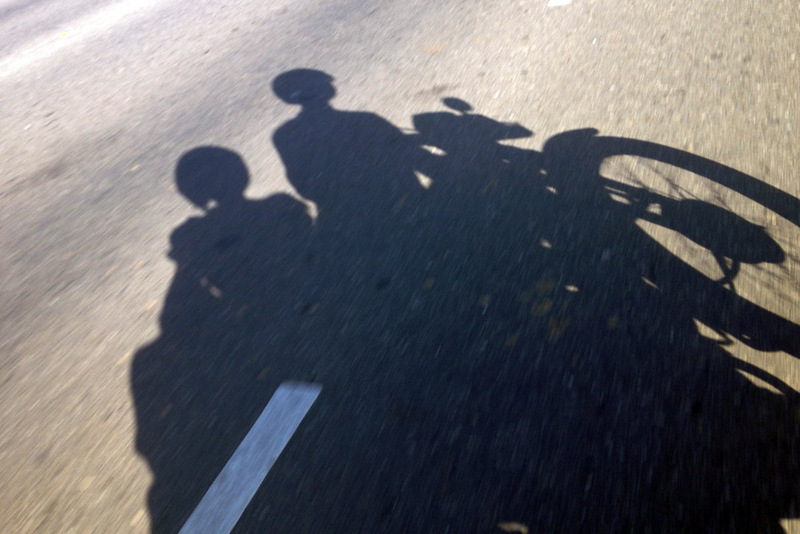 If at all possible, AVOID riding the motorbike for more than 8 hours at a time. Under 6 hours is really for the best. 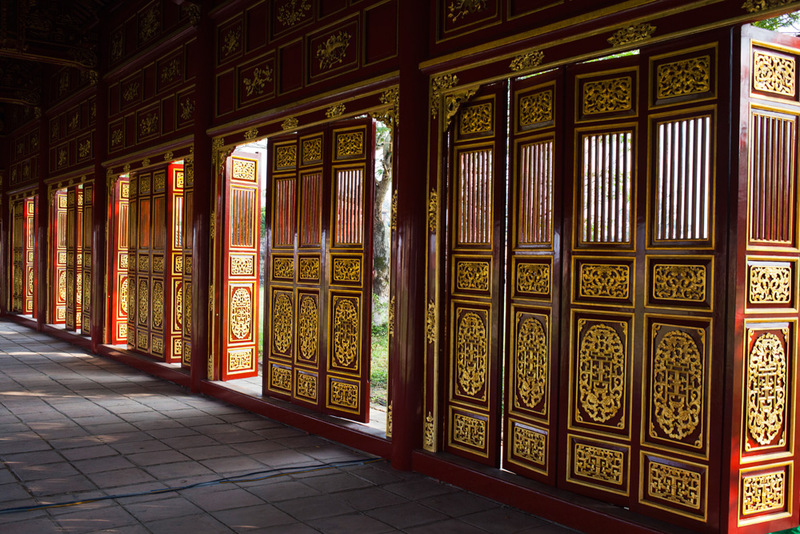 Exploring the former royal capital – Hue, Vietnam. 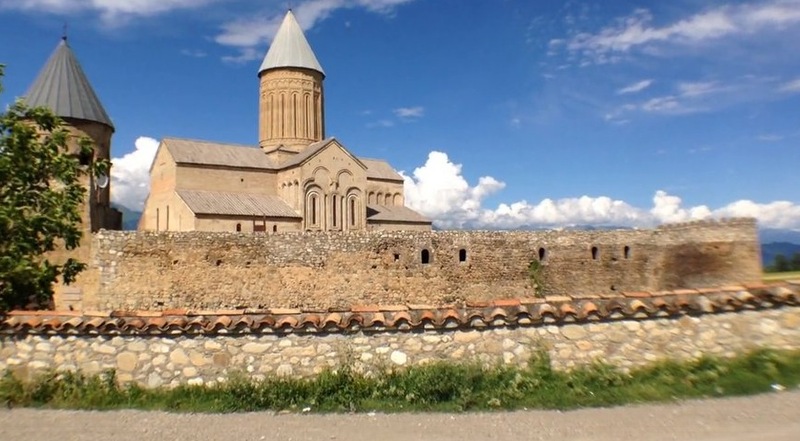 A lot of the splendor has been destroyed by the War, but restoration work has done wonders. 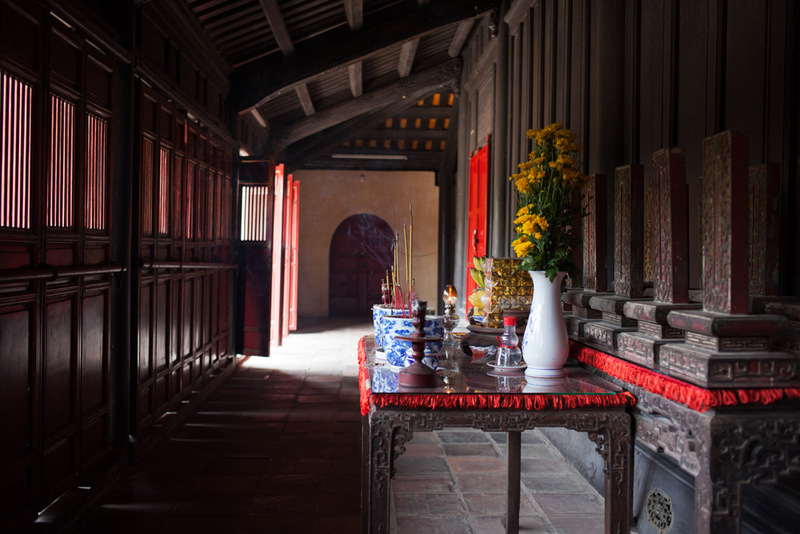 We’ve explored Hue for two days on a prior trip, and would highly recommend you do the same. 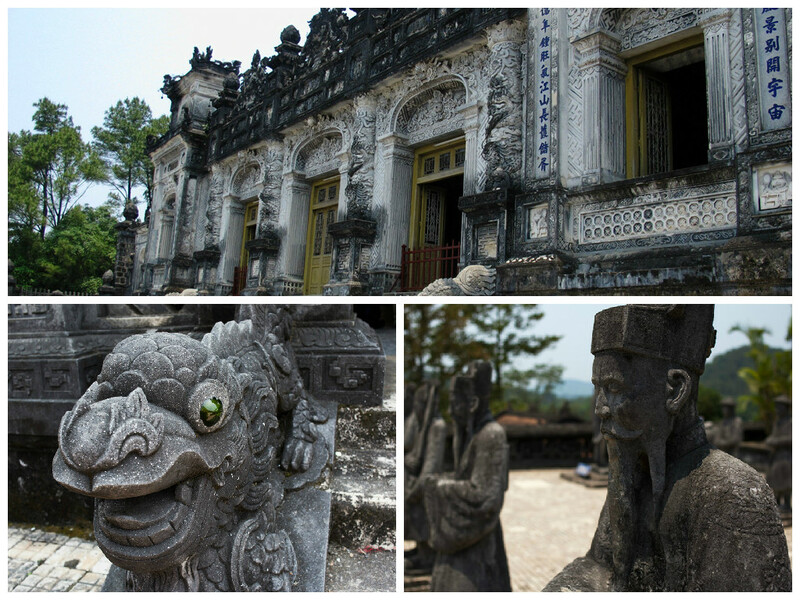 The royal tombs are impressive, and the town is imbued with much history that has sadly been destroyed in many other parts of Vietnam. 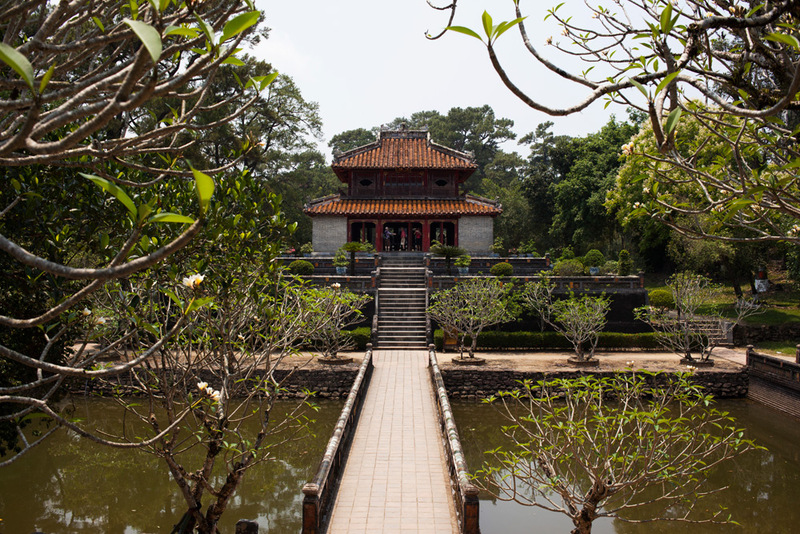 Exploring the former royal capital – Hue, Vietnam. These royal tombs are pretty badass. And lastly, obviously we were making a huge hook by stopping at the border. 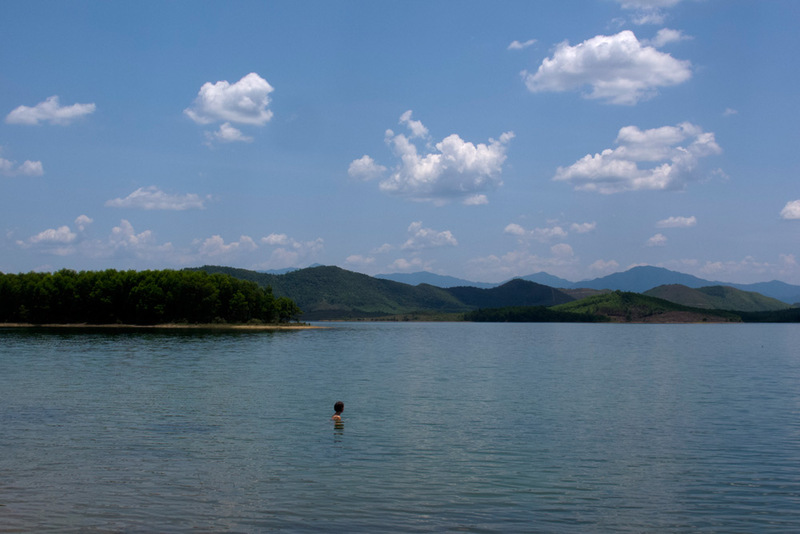 It would make much more sense to travel Phong Na – Hue. This day was one of our favorite riding days in Vietnam. The Hai Van Pass really is incredible. 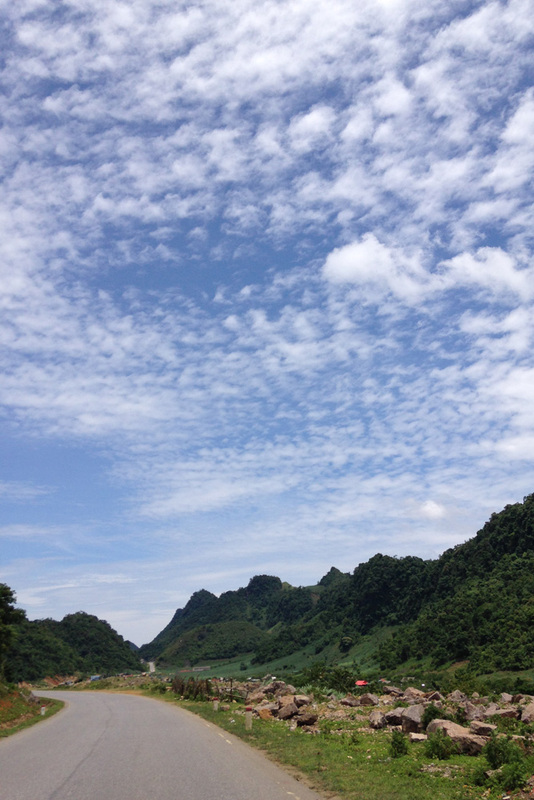 Sure there are a lot of scenic areas, mountain passes with great views, and in general incredible nature in Vietnam. But what’s special about this road, is that it’s not only super scenic, but it’s also super short, and there are lots of great stopping points, making the journey itself a breeze. Admiring the views on the Hai Van Pass, Vietnam. 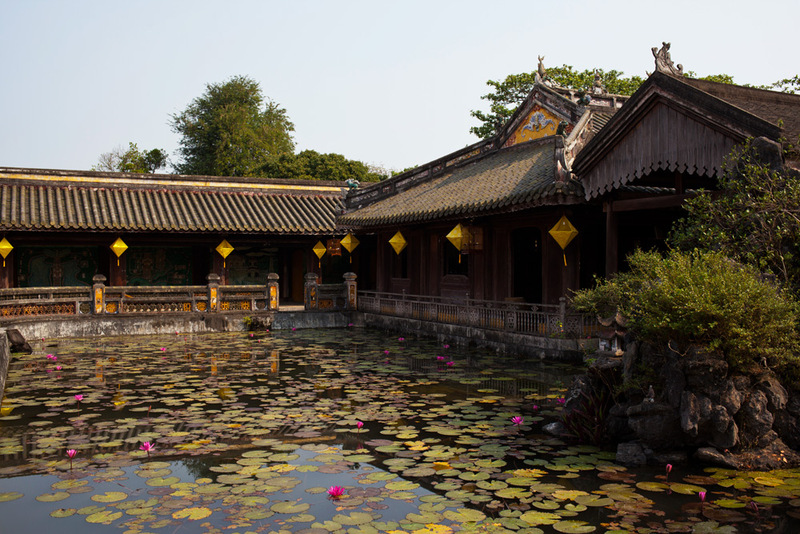 We spent a week in Hoi An, and enjoyed ourselves immensely. But we were taking in the last bits of Vietnam, and really making the most of our 15 day re-entry stamp. 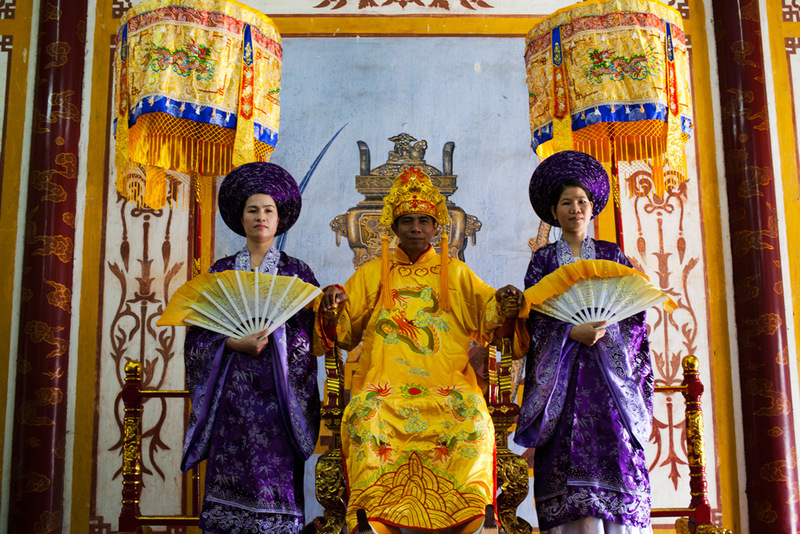 I would say 2-4 days would do Hoi An justice, depending on what you want to get out of the experience. 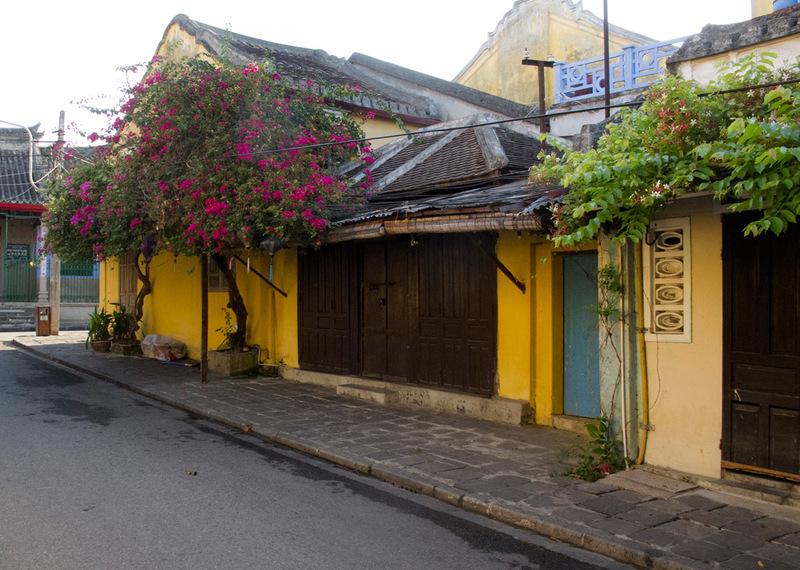 Charming Old Town of Hoi An, Vietnam. 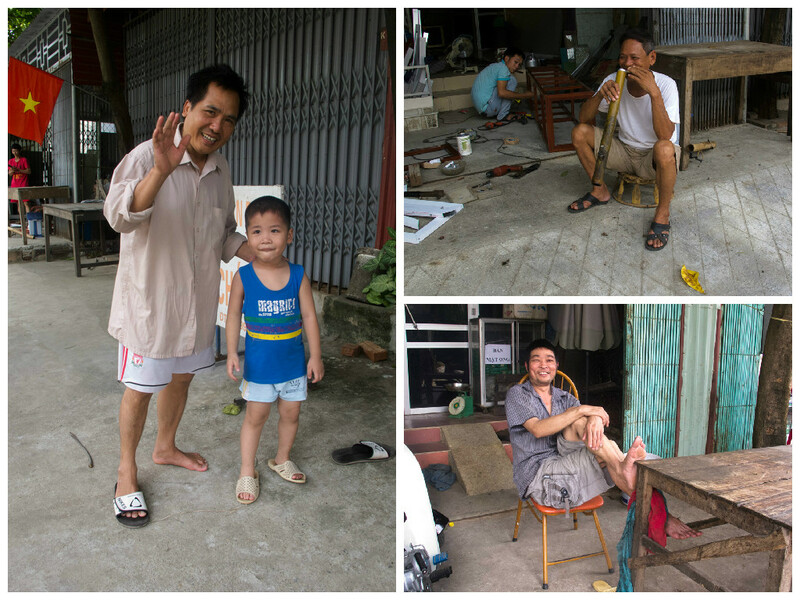 We sold our motorcycle to another traveler in Hoi An. It was sad to say goodbye after so many good times on the road with Indi. But her spirit of adventure will always be with us. 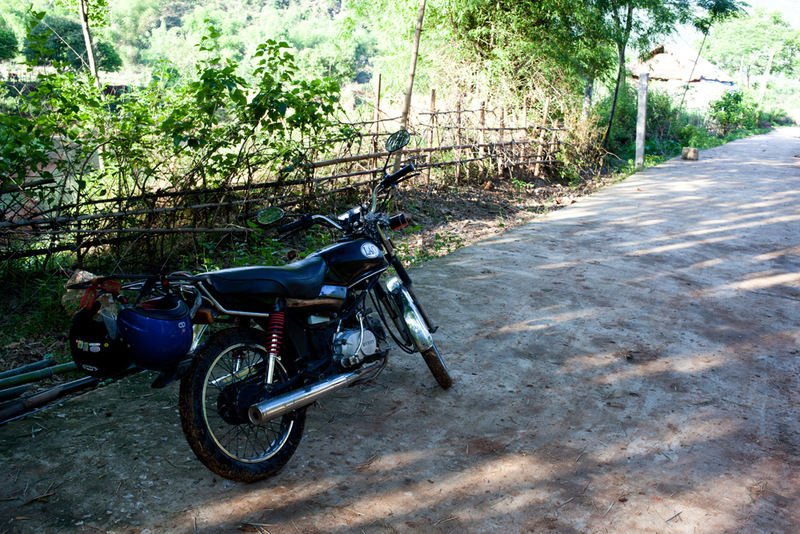 Our bike, Indonesia, or Indi for short, served us beautifully in Laos and Vietnam. 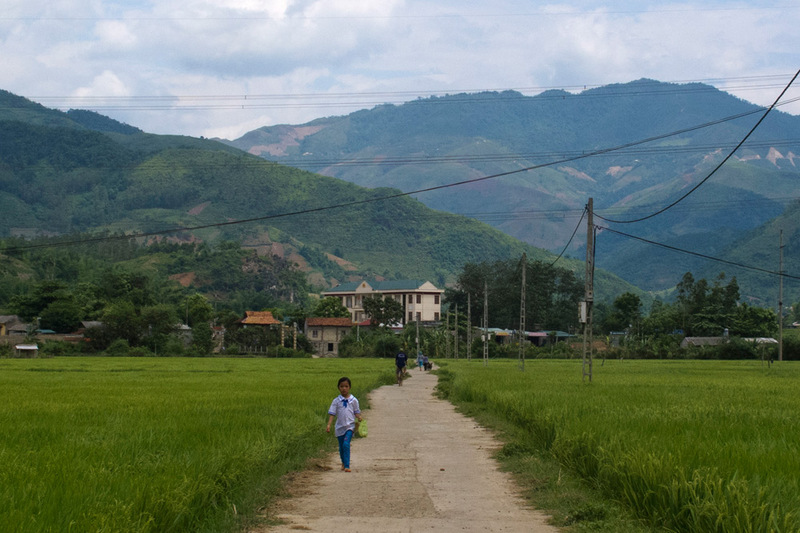 Mai Chau, Vietnam. 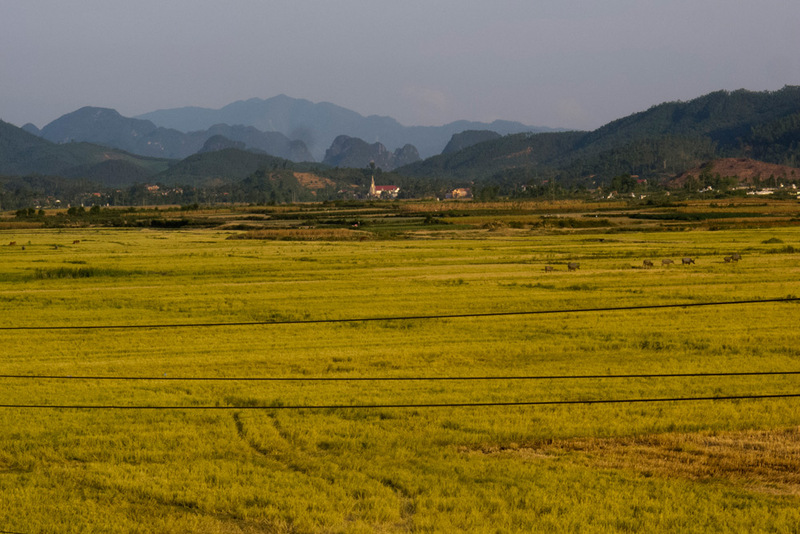 PS: You can get some ideas on how to continue your trip to Saigon in our EasyRider post, which describes a 5-day journey between Nha Trang and Saigon. 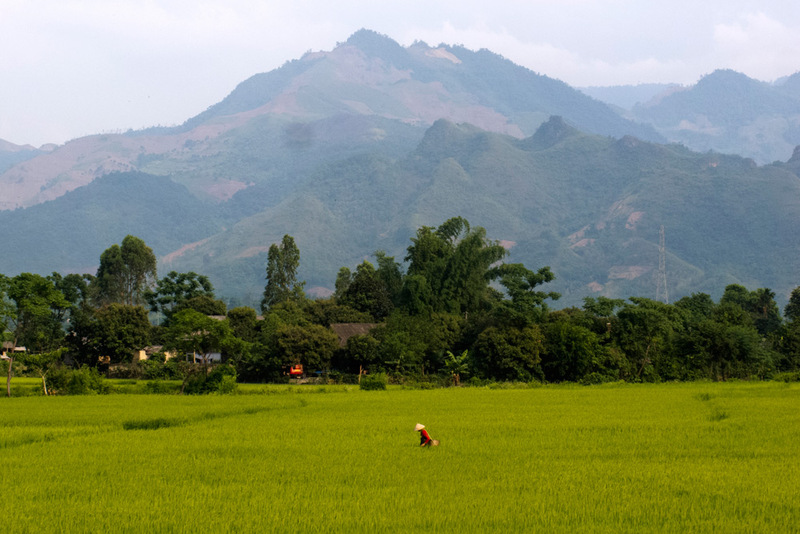 As a reward for reading this lengthy account of our adventures, you get a gif of the rice harvest in Mai Chau. YAY!